Family continues to be a wellspring of inspiration and learning for Blanco. His third book of poetry, Looking for The Gulf Motel, is a genealogy of the heart, exploring how his family’s emotion legacy has shaped—and continues shaping—his perspectives. The collection is presented in three movements, each one chronicling his understanding of a particular facet of life from childhood into adulthood. As a child born into the milieu of his Cuban exiled familia, the first movement delves into early questions of cultural identity and their evolution into his unrelenting sense of displacement and quest for the elusive meaning of home. The second, begins with poems peering back into family again, examining the blurred lines of gender, the frailty of his father-son relationship, and the intersection of his cultural and sexual identities as a Cuban-American gay man living in rural Maine. In the last movement, poems focused on his mother’s life shaped by exile, his father’s death, and the passing of a generation of relatives, all provide lessons about his own impermanence in the world and the permanence of loss. 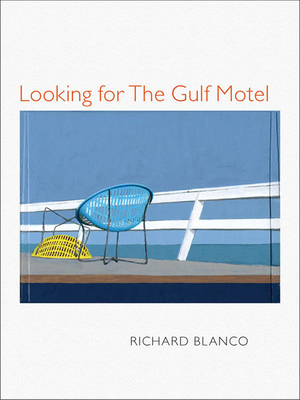 Looking for the Gulf Motel is looking for the beauty of that which we cannot hold onto, be it country, family, or love. Richard Blanco was selected as the 2013 inaugural poet for President Barack Obama. He is the author of two other poetry collections: Directions to The Beach of the Dead, winner of the PEN/Beyond Margins Award; and City of a Hundred Fires, winner of the Agnes Lynch Starrett Poetry Prize. Exploring themes of Latino identity and place, Blanco's poems have appeared in Best American Poetry 2000 and Best American Prose Poems and have been featured on NPR. He is a fellow of the Bread Loaf Writers Conference, recipient of two Florida Artist Fellowships, and has taught at Georgetown and American universities. A builder of cities and poems, Blanco is also a professional civil engineer. "These are poems of poetic beauty and heart, confession and acceptance, courage and love. Wonderful."